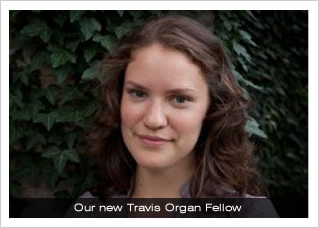 prize, and at McGill was awarded the W. Douglas Clark Memorial and the Douglas Mackey prizes for organ at McGill. Hilary writes "I am very pleased and excited to be joining the team at All Saints. 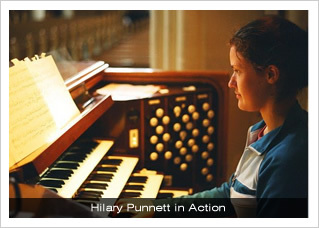 Having spent a rewarding two years as Organ Scholar at Southwell Minster, and four years at Christ Church Cathedral in Montreal, Canada, I am looking forward to incorporating my international experiences of Cathedral music-making with All Saints, a parish with a splendid reputation for high-quality music-making". choristers, deputising for the Director of Music and developing the choral and organ outreach programme. The Fellowship is named in memory of Miss Valerie Travis, a great supporter of the choral foundation at All Saints, who died in October 2008.